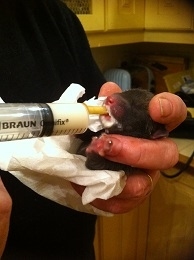 Our first orphan of the year arrived on February 24th a tiny one day old fox cub. She had been found crying on a pavement in Eastbourne, very cold, with a large wound on her side. Trevor Weeks founder of WRAS got the call and spent the first night trying to get fluids into her. She was very reluctant and didn’t take a lot that night despite Trevor’s efforts. The next morning she was taken to a local vet, who checked her over and put clips into her wound, I then collected her. She was quite flat when I picked her up and not really interested in anything to drink, which really worried me. But with a little perseverance and 2hrly feeds through the day and night she began to rally. You now can’t get the bottle to her quick enough. She weighed just 116g when she came in and now 6 days later weighs 165g. She is the youngest fox cub I have had to look after, and I am so glad she has pulled through the sleepless nights were worth it!! I don’t like to name them until they look like they are doing ok, but have now decided to call her Poppet. Fingers crossed she continues to improve.